If you've ever been accused of wearing your heart on your sleeve then we think we've found the perfect garment for you. "But Dave Desk ," you ask. "How is that possible? And can I put it through a normal wash with my smalls?" The Virtuali-Tee is emblazoned with a QR code shaped like a rib cage. When you scan it using a free app on your phone you'll get to see, in squishy 3D, exactly how your innards might look were you to wear your skin the wrong way round. So it's the tech that's the smart bit of kit. The tee is just as ordinary as they come and normal rules apply to keeping that clean. The brainchild of whiz kids Ed Barton and Ben Kidd, more than 3,000 of these shirts have already been sold. You can buy this anatomical adventure you can wear from Amazon but as it's so popular, it's currently out of stock. BUT the Dave Desk has been told more are on the way at the back end of the month so you'll be able to catch up with all those biology lessons you skipped at your own pace. The Virtuali-Tee costs £25, which isn't much more than the price of a normal T-shirt really. Except normal tees don't let you unlock the inner workings of the human body. Something which is slightly more useful than your drawer full of scraggy aide-mémoires to every gig you've ever been to when you think about it. 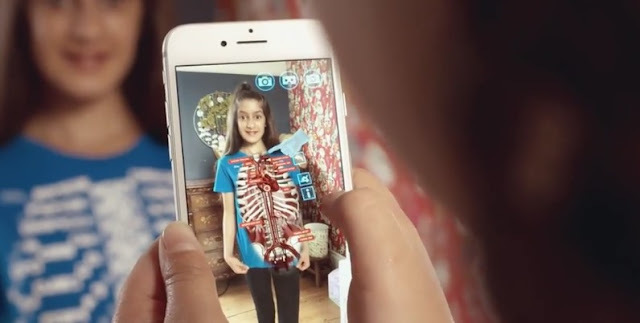 0 Response to "New X-ray T-shirt lets you take a virtual tour inside your own body - and it's just £25"